Bruker’s beer analysis solution enables fast and automated beer quality control and optimisation of shelf life. 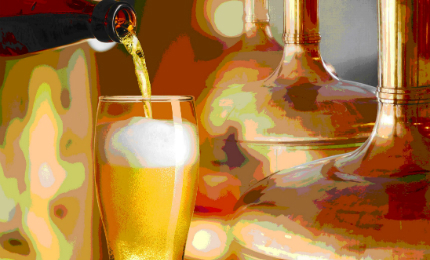 EPR lag time assay is a powerful technique for measuring antioxidant capacity in beer. E-scan, an instrument dedicated to lag time and antioxidant assays enables performance of this assay, formerly requiring specialised procedures, with a compact, easy-to-use bench top analyser. Oxidative staling of beer occurs by a free radical process. During storage, trace amounts of transition metals such as iron or copper will catalyse the conversion of molecular oxygen to ‘reactive oxygen species’ (ROS). One ROS is the hydroxyl free radical, which rapidly oxidises components of beer to free radicals. Beer-derived free radicals perpetuate a chain reaction resulting in carbonyl end products such as aldehydes and ketones. These carbonyl compounds cause the ‘cardboard like’ flavour of stale beer. Antioxidants in beer help resist free radical oxidation. Oxidation can be minimised by optimising brewery operations and storage conditions to provide maximum antioxidant content in packaged beer. The EPR oxidation profile provides an analytical measure for evaluating the overall antioxidant status of beer at each stage of the brewing process. EPR data is also useful for predicting shelf life of a finished beer before it goes through packaging and distribution.